Are you planning to update iOS version and hope to tick off some useless data after upgrade? 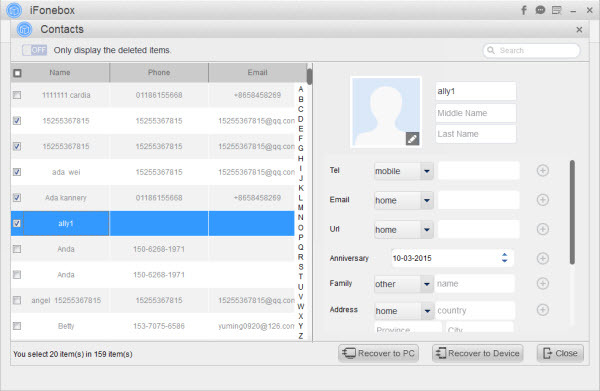 Did you only want to extract and transfer iTunes contacts to your restored iPhone? iFonebox would be the fast way to make it come true. After apple released the latest iOS version, I received many letters from our customers to ask me some questions about upgrade. One of the customers had the demand that he wanted to make a big clear of his iPhone with the update. He had made the iTunes backup before restoring the iPhone, then he just wanted to transfer the Contacts in iTunes back to iPhone. It sounds impossible only with the help of iTunes. Here we will introduce a fast way to help you only sync and transfer iTunes Contacts back to iPhone. The only tool you need is an iOS data recovery software, iFonebox. Just with few mouse clicks, all you iTunes Contacts will be return back to your iPhone and you are allowed to pick out these you do not need. Choose the edition you need and download the free trail version to preview the data in your iTunes backup, get the full version to extract iTunes backup data to you computer or transfer iTunes Notes and Contacts back to device directly. 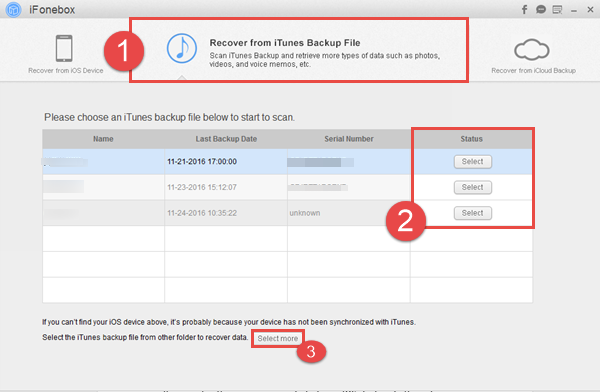 After installing iFonebox on your computer, launch the software and connect your iPhone to computer, then choose “Recover from iTunes Backup” as the recovery mode. Then the program will display all the iTunes backup in your computer. Just select the one you need and click “Start Scan” to analysis the backup file. If there are large database in your iTunes backup, it will take more time to finish the scanning, just wait patiently. When the scanning is finished, click “Contacts”on the category and preview all the notes from your iTunes backup. Then just pick out the notes you need and click “Transfer all selected to device”, a few seconds later, these selected contacts will be restored back to your iPhone automatically. Then a totally new iPhone only with Contacts of latest iOS version comes out. You will have enough space to add the data you need freely.